The pact that Canada is being urged to join looks a lot like the "bad deal" Trudeau vowed to reject. 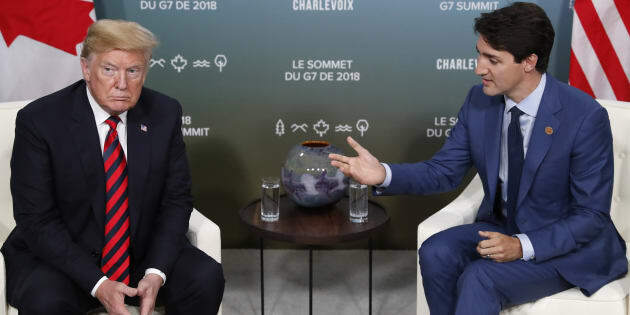 U.S. President Donald Trump meets with Prime Minister Justin Trudeau in a bilateral meeting at the G7 Summit in Charlevoix, Que., on June 8, 2018. Canadian and U.S. officials are optimistic that Canada will be able to negotiate its way into the U.S.-Mexico trade agreement announced last weekend, but the going may prove harder than some think. On one side, there is U.S. President Donald Trump, who has threatened to slap ruinous auto tariffs on Canada if it doesn't join the trade agreement by August 31, the deadline imposed by the Office of the U.S. Trade Representative. On the other side, Prime Minister Justin Trudeau is vowing to reject a NAFTA agreement rather than sign on to a potentially "bad deal." Well, going by Canada's earlier trade positions, it appears that the U.S. and Mexico have agreed to a fair number of things that Canada has seen as "a bad deal." To be sure, some aspects of the deal are widely seen as good news for Canada. In particular, the agreement on autos requires that 75 per cent of auto content be made within the countries covered by the trade agreement, and 40 to 45 per cent of content must be made by workers earning US$16 per hour or more. That's "considered a win for manufacturers located in higher cost jurisdictions such as Canada and the U.S.," wrote Beata Caranci, chief economist at TD Bank. But on a number of issues, the U.S. and Mexico agreed to things Canada may not like at all. That poses a serious obstacle to a quick end to negotiations. Here are three key aspects of the U.S.-Mexico deal that Canada has been fighting against. The U.S. has convinced Mexico to adopt many of the U.S.'s strict intellectual property laws, something Canada resisted during negotiations on the Trans-Pacific Partnership (TPP) trade deal. These include a 75-year term for copyright past the creator's death. Canada's term is currently 50 years. "This is a 25-year increase over current law in Canada, and these barriers to information will stagnate culture and hinder people's ability to innovate," consumer advocacy group OpenMedia said this week. If Canada adopts this, "the cost will be significant, locking down works from the public domain for decades and potentially increasing educational costs by millions of dollars," wrote Michael Geist, the Canada Research Chair in Internet and E-commerce Law at the University of Ottawa. The deal also includes expanded protections for pharmaceuticals, which "may be deemed as a threat to certain Canadian industries, such as the thriving Canadian generic phar­maceuticals industry," Caranci wrote. Not to mention it could drive up drug prices for Canadians. It's been estimated that the patent extensions Canada agreed to in its trade deal with the European Union will cost Canadians hundreds of millions of dollars a year in additional drug costs. The intellectual property changes in the U.S.-Mexico deal "may require changes to Canadian law," states an analysis from the U.S.-based Center for Strategic and International Studies. The analysis noted that Canada fought against similar U.S. proposals during talks on the Trans-Pacific Partnership (TPP). When Trump withdrew the U.S. from TPP talks in 2017, those intellectual property provisions — and a number of other provisions that the U.S. was pushing for — were suspended from the deal by the remaining TPP countries. But for consumer advocates, it's the "notice-and-takedown" provisions that are raising the most alarm. Under those rules, website hosting services would be required to take down a website when they receive a notice that it may be infringing copyright. The U.S. system stands in stark contrast to Canada's "notice and notice" system, where internet service providers forward notices of infringement to alleged copyright infringers. "Under this deal, corporations would get massive new power to force websites to be taken down," OpenMedia said in a statement this week. Duty-free limits: A 'disaster' for Canada's retailers? Currently, the U.S. allows its citizens to order a maximum of US$800 worth of goods from abroad before paying taxes and duties, but Canada's limit is only $20, among the lowest levels of any country (though the amount rises for people who travelled to the U.S. for more than 24 hours). The Trump administration has been fighting to raise these limits, and in the U.S.-Mexico deal, Mexico will raise its limit — known as a de minimis threshold — to US$100 from US$50. Foreign Affairs Minister Chrystia Freeland speaks to the media as she comments during a break in trade talks at the Office of the U.S. Trade Representative, Thurs. Aug. 30. While that may sound like music to the ears of Canada's cross-border shoppers, Canada has resisted increasing the move so far in NAFTA negotiations. The Retail Council of Canada has called raising the duty-free limit a "disaster" because the reality of online sales "would immediately put Canadian business at a disadvantage. They would have to pay sales tax and duty, while the U.S. online seller would not have to. It does not make any sense whatsoever." NAFTA's Chapter 19 is one of three chapters in the existing trade pact that deal with dispute resolution, and it's the one Canada has championed most strongly. It was on Canada's insistence that it was included in the original Canada-U.S. trade deal in the first place. If a business feels it has been wronged by anti-dumping or countervailing duties, it can appeal to a Chapter 19 panel that has the power to rule against the duties. The tool has been used repeatedly by Canada in its long-running dispute over U.S. tariffs on Canadian softwood lumber. According to news reports, Mexico has agreed to eliminate Chapter 19. Some experts say that Chapter 19 hasn't worked very well in the past (after all, that softwood lumber dispute is still going on) and may not be worth fighting for. But, as an analysis from Bloomberg News notes, the federal Liberals see cancellation of Chapter 19 as a deal-breaker. On this issue, "either Canada or the U.S. will have to blink," the analysis said. So it may be that Prime Minister Justin Trudeau will yet be faced with the "bad deal" he has sworn to reject. That Friday deadline for Canada to join the trade pact is anything but in the bag.